Belgium have had a great start in the World Cup this this season. Having defeated debutants Panama 3-0 in the opening fixture, the team are looking in great spirits. The team look well composed and balanced. They have had the perfect start and haven’t even conceded a goal in the tournament so far. 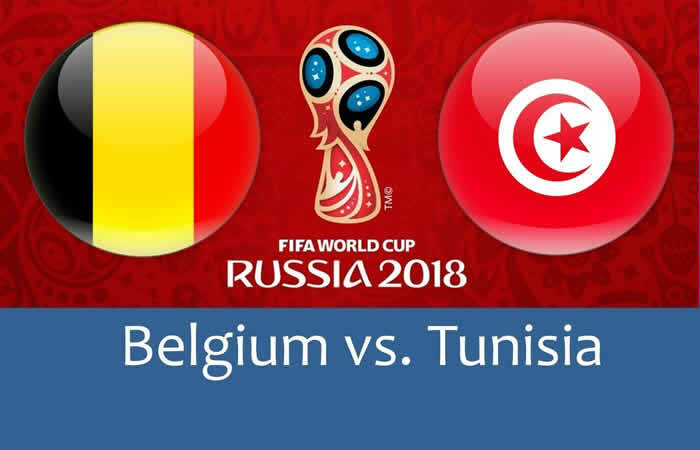 Belgium face off against Tunisia, who were defeated by England in their opening fixture thanks to Harry Kane and co.
Belgium face Tunisia in the Otkrytie Arena, one of the newly built stadiums by the hosts, Russia. A win tomorrow would more or less secure a spot in the round of 16. Should England to win, it would be a great match to see in round 3. Roberto Martinez is expected to field an unchanged side against Tunisia. Belgium are one of the most organised sides and will find it very easy as the team gel pretty well. The Chelsea keeper had kept a clean sheet in the opener and didn’t have to do much. Based on the scores of the competition, him earning a clean sheet tomorrow will be a great progress in his quest to get the Golden Glove. The defensive three of Alderweireld, Boyata and Vertonghen are expected to retain their places in the line-ups. Martinez has stated that Kompany and Vermealen have recovered from injury but still haven’t attained match fitness. Belgium kept a clean sheet and weren’t tested so far and they expect to keep their consistent run going on. The midfielder also had a great match against Panama. De Bruyne was great in attack as well as controlling the game. He also claimed an assist and was threatening. Witsel was great as a holding midfielder. He controlled the game from the back and won most of his aerial duals. Meunier made frequent attacking runs and also impressed with his physical strength on the wings. Carrasco started as a left wing back but wasn’t much involved in the game. He is expected to retain his place but it won’t be a surprise if Jordan Lukaku starts. Captain Hazard didn’t have a stellar match against Panama but bagged an assist. He was positive in attacking runs but went for more self-glory in the first half. He should start too. Mertens on the hand was one of the most dangerous players on the pitch and was the one who really made the game tick with his great runs an unpredictability. He also scored a wonderful goal. Lukaku was the best player in the match against Panama. He scored two goals and is in great form and momentum. It is highly likely that he is going to score tomorrow with the high-quality service he gets from the back. We should expect one more fantastic game from Belgium. Tunisia haven’t scored a proper goal in the tournament and are more of a defensive side. They are shy in attack and are expected to defend deeply owing to the firepower Belgium have. They have just scored a penalty due to a foul by Kyle Walker and the world haven’t yet seen the full version of their attack as they will once again be defensive. It is going to be an easy game for a balanced Belgium side.